Pultenaea penna, described in 2003. Photo: T.J. Horn. The new, 5th edition of Flora of South Australia is published online in PDF-form. 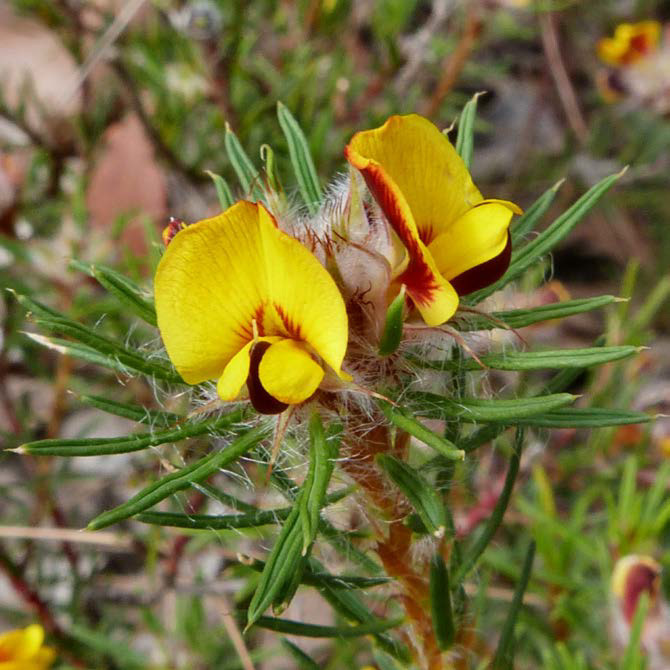 Today, 30 June 2015, the State Herbarium of South Australia released a revised version of the chapter on the plant family Fabaceae (peas). In addition to the existing treatments of the tribes Bossiaeeae & Brongniartieae (by I.R. Thompson) and Indigofereae (by P.G. Wilson), this chapter now also includes the tribe Mirbelieae. With 13 genera and species, this is the largest group of native peas. It was mainly written by Andrew Craigie, Peter Lang co-authored the genus Pultenaea and up-dated Dillwynia together with Jürgen Kellermann. The general link to the 5th edition of Flora of South Australia is flora.sa.gov.au, providing current treatments, glossary, introduction and cover pages for printing. Previous versions of Flora treatments are still available from our Superseded treatments page. This entry was posted in Publications on 30 June, 2015 by Jürgen.